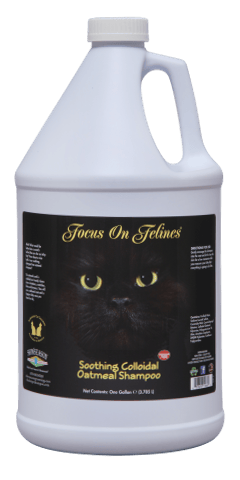 Focus on Felines Soothing Oatmeal Shampoo is a detergent free oatmeal shampoo. The oatmeal used is colloidal so it easily calms down irritations, scratches, bites and dryness. You will see a softened coat and a happier kitty once you have her dry. Biodegradable, Cruelty Free, Non-Toxic and Fragrance Free. Ingredients: Purified Water, Sodium Laureth Sulfate, Cocamide MEA, Cocamidopropyl Betaine, Colloidal Oatmeal, Glycerine, Polyquaternium 10, Aloe, Acrylates Copolymer, DMDM Hydantoin, Sunflower Triglycerides.